Gramps, I saw that Z at Wally's last week but didn't buy it. Yesterday I talked myself into it but it wasn't there anymore. Just as well--I spent the money on a lot of cool stuff at the local toy show today. I saw the VW too. It looked okay to me, I just wasn't that interested in it. While the 240Z is out of my normal model lane I always liked it and wanted to buy one in 1971 but with a new baby we had to settle for a Vega GT Kammback instead. So after getting my kart filled with bird food at Walmart I felt it was appropriate to check out diecasts and was surprised to find this M2 Nissan 1970 Fairlady 240Z. Yes it is a Nissan and not a Datsun. The first give away are the mirrors and then the steering wheel on the right hand side. Just wished it had a body colored hood and stock wheels. But wait, this model is the high performance Z432 with the S20 engine so is correct for what it is. There was also a 1952 VW Beetle b y M2 but it did not look right to me. The wheels looked small and the roof looked inflated so it did not follow me home. I *MIGHT* have a set of stock wheels froma Fujimi Fairlady I built. 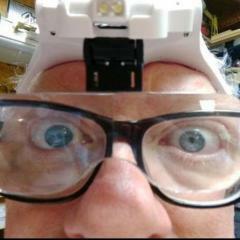 I used the mini lites on mine. I'll look if you want to try it. Thanks for the offer Randy but I think I will leave it alone. The box says It is a Walmart exclusive and the markings are unique and would not match the stock wheels. Since posting the M2 240 Z I have found that Greenlight has released 240Zs in racing liveries including the Pete Brock/John Morton BRE markings. Looks tempting. 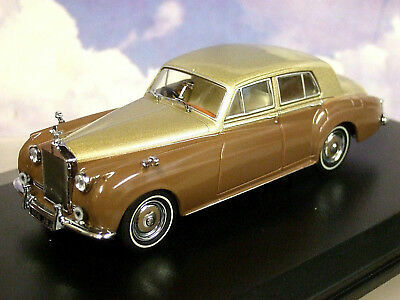 Bought this one on Ebay, Gary..... and it is arriving tomorrow...... 1:43 Oxford Diecast Rolls-Royce Silver Cloud I in Sand / Sable. The Rolls Royce looks amazing. Hard to believe the scale. 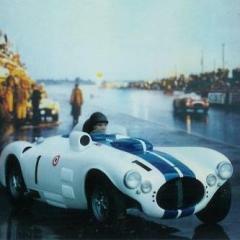 As you said previously there are many more choices in 1/43rd. 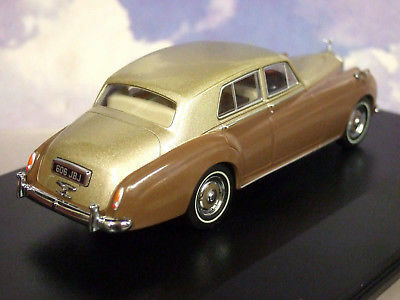 This is my favourite Rolls-Royce of all the models, and Oxford Diecast is the only company that produces the Silver Cloud I from 1955 to 1959. The Hooper Empress Silver Cloud I has the coachbuilt body, also by Oxford Diecast, but I particularly wanted the standard body version of this motor car..... ' the finest motor car in the world ' ( FACT ). As you can see, they really have produced an extremely accurate model in this small 1:43 scale which is remarkable really. A modeling friend and I did a trade, 2 Finecast metal kits for 2 Franklin Mint diecasts. 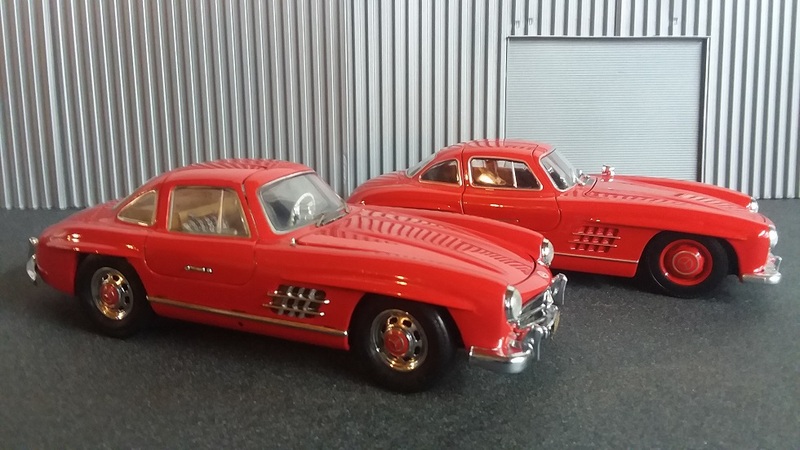 I received the Franklin Mint 1957 Corvette Fiberglass Series and the Mercedes 300SL. Franklin Mint did some strange things. 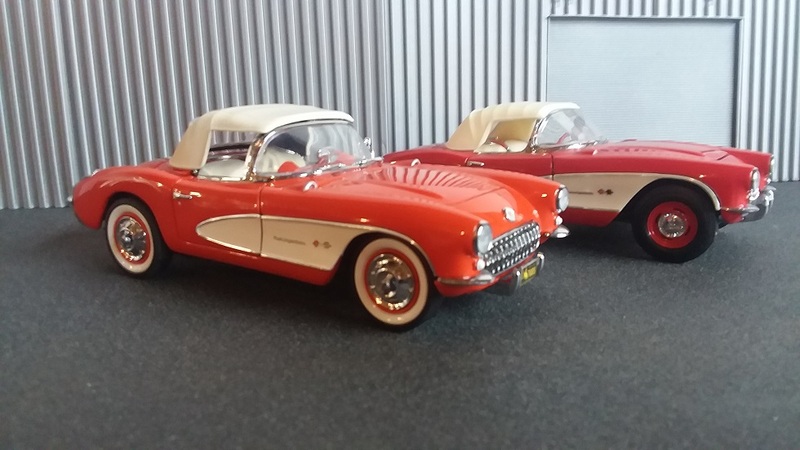 There are two 57 Corvettes and they are different castings between the first release and the "fiberglass series". Also novel about the fiberglass version is the rear leaf springs are rubber like supposedly for a working suspension, never seen that before. The number of bows in the soft tops and the engines are different too. Strange that they would start all over again. The 300SL is fascinating. Comparing it with the $10 Welly 300SL is interesting in that the Mint uses chromed window surrounds embedded in the glass and the Welly uses tampo printed surrounds and has a lot less detail it seems, not surprising for the cost though. I do like the original 57 Vette. I've had a couple, and sold them off. I like the dog dish hubcaps. I have the aqua 56 FM, so that serves my needs for that era. I have some plastic builtups somewhere too. I remember building them, but can't remember where they are. I compared the silver FM and Welly. My son wanted the Welly at a rite aid. 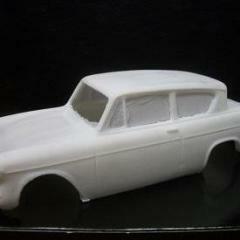 And I got the Mint car in a collection later. Hard to compare them really, but they both serve a purpose in collecting. The plaid interior in the Mint car really makes it for me. 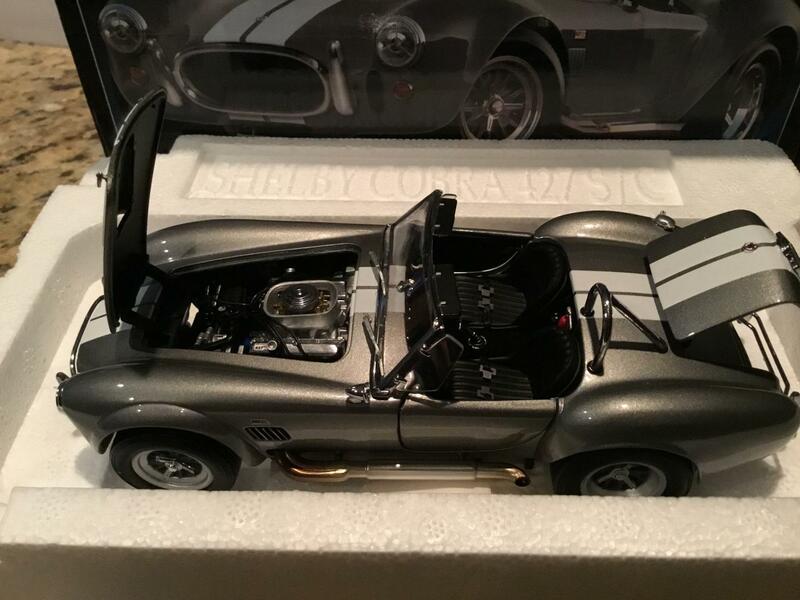 Finally found the grey WIX Cobra at a good price . These are much nicer than I thought they were . The WIX Cobras are such a pleasant surprise.